In order to afford a modest, one-bedroom apartment at Fair Market Rent in Washington, renters need to earn $17.26 per hour. This is Washington’s 2015 one-bedroom Housing Wage, revealed in a national report released today. Washington, D.C.-based research and advocacy organization National Low Income Housing Coalition and the statewide legislative advocacy organization Washington Low Income Housing Alliance jointly released the Out of Reach 2015 report. Every year, Out of Reach reports on the Housing Wage for all states, counties, metropolitan areas, and combined non-metropolitan areas in the country. The report presents housing costs nationwide, highlighting the gap between what renters earn and what it costs to afford rent at fair market value. According to the report, this state is the tenth most expensive state for renters. There is no doubt that the high cost of rental housing is driving increases in homelessness. According to an article published recently in the Journal of Urban Affairs, an increase of $100 in median rent for an area results in a 15 percent (metro areas) and a 39 percent (nearby suburbs and rural areas) increase in homelessness. While the lack of affordable housing is a large part of why homelessness rates are increasing in Washington, wages have also not kept pace with rising rents. The federal minimum wage has remained at $7.25 an hour without an increase since 2009, generating debate and calls to raise the wage both at the state and federal levels. In no state, even those where the minimum wage has been set above the federal standard, can a minimum wage renter working a 40-hour work week afford a one-bedroom rental unit at Fair Market Rent. Working at the minimum wage of $9.47 in Washington, a family must have 1.8 wage earners working full-time, or one full-time earner working 73 hours a week to afford a modest one-bedroom apartment. Affording a rental home continues to be difficult even in Seattle, which has the highest minimum wage in the country at $15. The one-bedroom fair market rent in the city is a whopping $1,150, the highest in the state. Someone earning $15/hour would need to work 59 hours per week or 1.5 full-time jobs to afford this rent. This is why advocates continue to work at the federal level for national solutions to the nation’s growing housing affordability crisis. The Housing Alliance joins with the National Low Income Housing Coalition in supporting the National Housing Trust Fund, which will provide communities with funds to create homes that are affordable for people at the lowest income levels. You can view/download the entire report here. Compare data from cities and counties to state data here. May 5, 2015 is the Seattle Foundation’s GiveBIG Day of Champions, a one-day-only online donation event designed to raise money for nonprofit organizations. Contributions from GiveBIG sponsors are used to stretch donations made to nonprofits, up to $2,500 per donor, per organization. To paint a better picture, GiveBig Day 2014 stretched each donation by about 8 cents per dollar. Also all GiveBIG Day donors are in a pool to be randomly selected for a Golden Ticket. Recipients of the Golden Ticket will receive a $100 Starbucks gift card as well as an extra $1,000 to your selected nonprofit from the Seattle Foundation. GiveBIG is a huge day for Seattle nonprofits, and it will be an especially big day for the Housing Alliance. Thanks to a few Champion Board Members and Supporters, any online donations made to the Alliance anytime on May 5 will be matched 1:1. Any donation up to $6,000 is eligible for this 1:1 match. This plus the GiveBIG stretch means that your donation will be more then doubled! Donating to the Housing Alliance on GiveBIG Day will help us take our mission to the next level. Our recently released 2015-2018 Strategic Plan is moving us forward, and donations received through GiveBIG will be key in doing so. Affordable homes remain out of reach for too many Washingtonians, particularly those with the lowest incomes. We see these inequalities in our communities every day, from the street to the classroom. The reasons for homelessness and housing instability are complex, and are at the core of our public policies. Change is difficult, but it is not impossible. The Housing Alliance seeks swift, decisive, and thoughtful change. To bring about that change, we work to bring people and organizations together in order to have the greatest impact on policy. 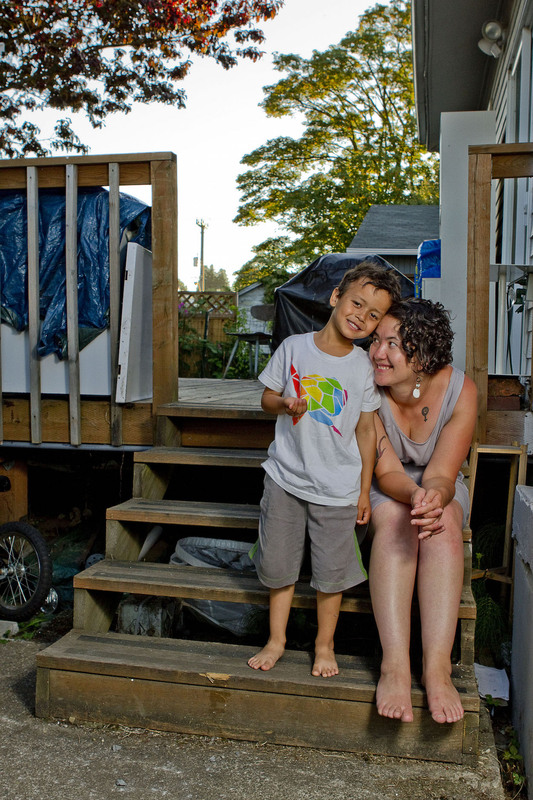 Your donation will support a strong, statewide movement for affordable homes and an end to homelessness, and there’s no better way to give then on Seattle’s GiveBig Day of Champions. Click here at bit.ly/GIVEWLIHA on May 5, 2015 to GiveBig with the Housing Alliance! As predicted, the legislature adjourned the regular session on Friday without reaching agreement on a budget. The main budget under negotiation is the biennial operating budget, which by law is needed by July 1. Legislators will need to come back during what is called a “special session” to continue to negotiate the budget, and the governor announced that this session will start this Wednesday, April 29. You can still send emails during the special session! 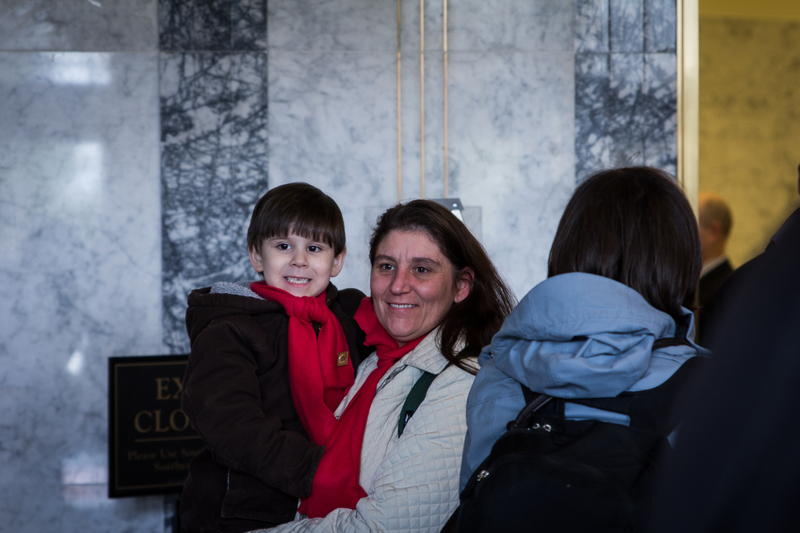 The 2015 Washington State Legislative Session officially ended Friday, April 24. Legislators will begin the special session Wednesday, April 29 to finalize a budget. 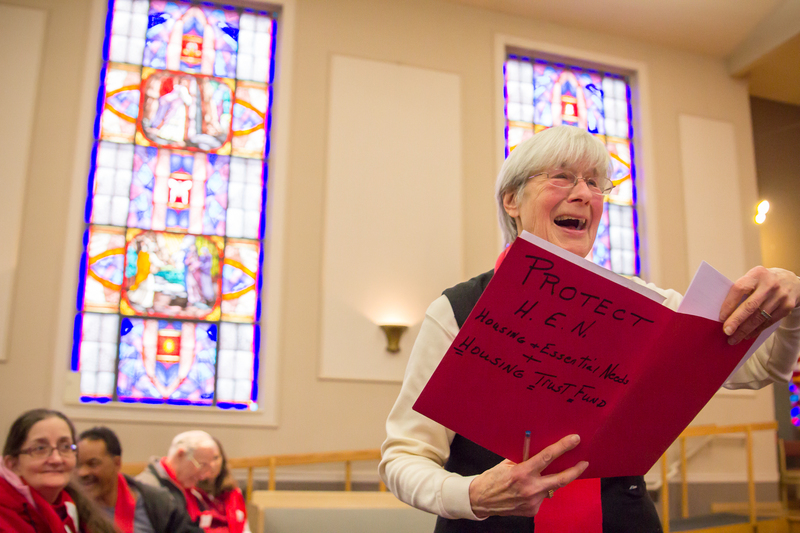 So you still have an opportunity to tell your legislators to pass a final budget that includes both creating new sources of revenue and making deep investments in both affordable housing and safety net services. Join the Housing Alliance to debrief the session and to discuss how affordable housing and homelessness issues fared. We will discuss what to expect for this special session and what advocates can do to ensure that the final budgets include the House’s affordable housing allocations. After $12 billion in budget cuts to safety net services that protect our most vulnerable community members since the “Great Recession”, the legislature faces a clear choice to enact revenue. To fully maintain the safety net at current levels, while also meeting the state Supreme Court mandate to invest more in basic education, revenue is indeed needed. New revenue streams should have been instituted long before the legislature enacted the $12 billion in cuts. But the legislature has tangible and fair tax options before them now. The special session gives lawmakers the opportunity to continue negotiations over the variety of tax options currently on the table, including a Capital Gains Tax and a Carbon Polluters Tax bill. See previous blog posts for more details on the tax options on the table. This session was a mixed bag with some important policy achievements. Extended Foster Care (SB 5740), the Homeless Youth Act (SB 5404), and the King County Stadium Bonds bill (HB 1223), which will allow for $45 million in new bonds for affordable housing, are important accomplishments this session. Missed opportunities include the Source of Income Protections bill (HB 1565) which would have outlawed discrimination against renters relying on government assistance to make ends meet and the Fair Tenant Screening Report bill (HB 1257) which would have allowed renters to pay for one comprehensive tenant screening report while applying for housing. And with many important affordable housing and homelessness programs still awaiting a budget allocation—such as the Housing Trust Fund—the overall impact of the legislative session remains to be seen. You Still Made a Difference! 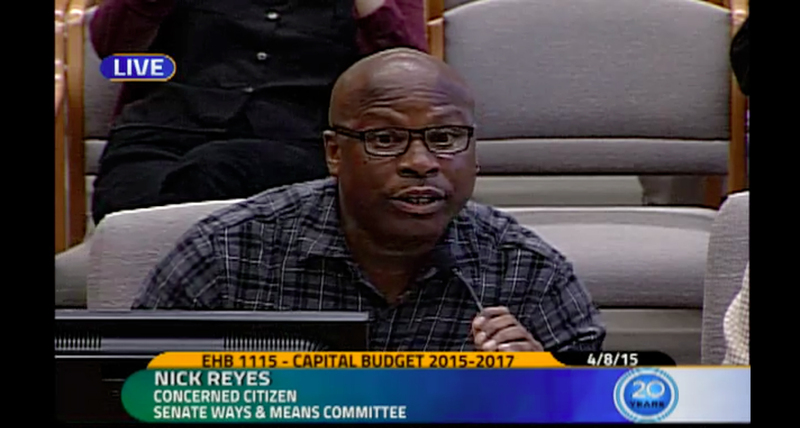 Clearly, affordable housing and homelessness advocates have risen up this session and were heard loud and clear. 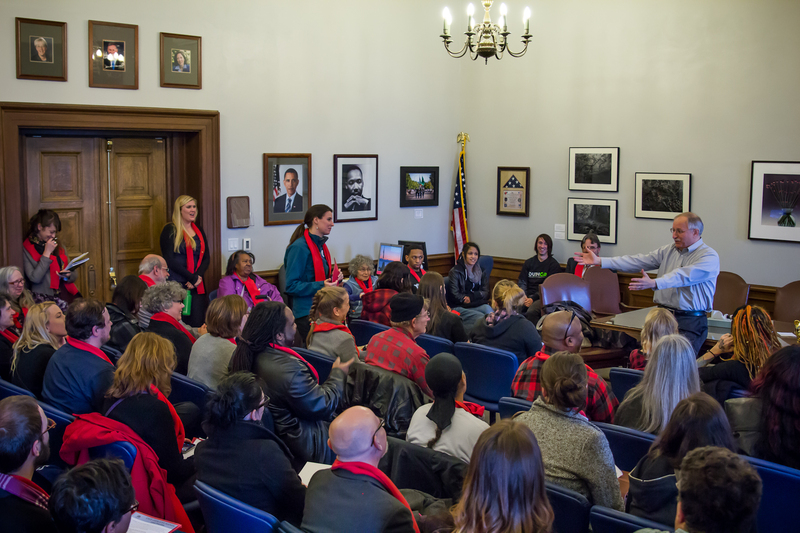 From the record-breaking attendance at this year’s Homeless Housing and Advocacy Day to the thousands of advocacy phone calls, emails, letters, and meetings, you were a powerful presence in Olympia. Affordable housing is a significant issue on the radar of budget negotiators, but advocacy will still be needed to ensure that the final budgets fully reflect our shared priorities. 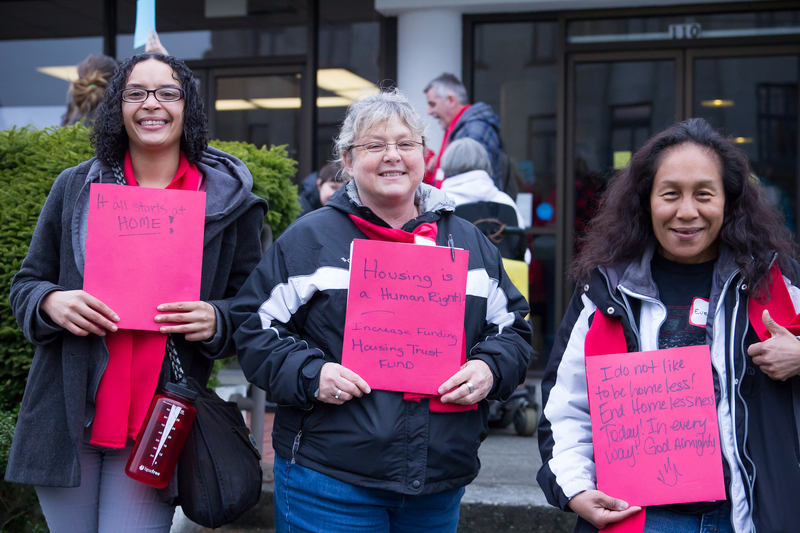 If you haven’t already taken action this last week to tell your lawmakers that the final budget needs to fully invest in affordable housing and homelessness prevention programs, please do so now. And please stay tuned for updates and opportunities to take action. Please take action today to send your lawmakers a strong and clear message about what the final budgets should include. As always, stay tuned to the Housing Alliance’s social media (Twitter and Facebook) throughout the week for timely updates. Join the Housing Alliance Team! 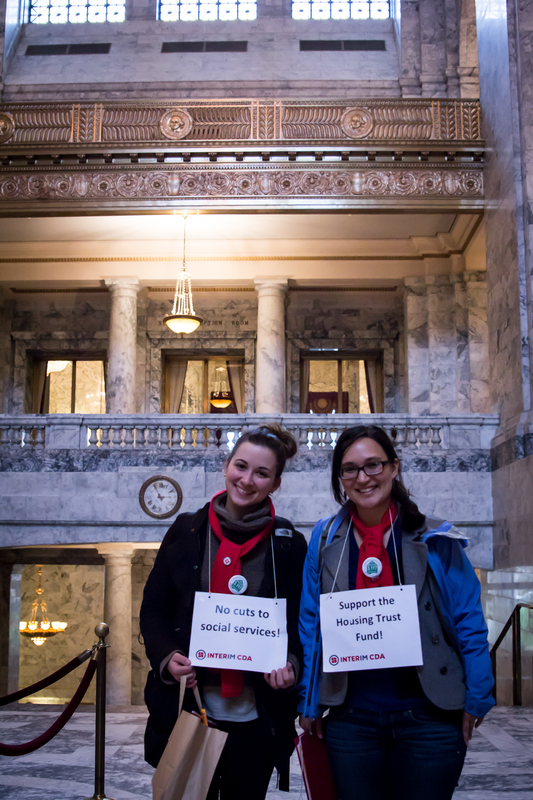 Now you have an opportunity to join our awesome team leading the movement to ensure all Washington residents have the opportunity for safe, healthy, affordable homes in thriving communities. We are searching for an Operations and Finance Administrator. Go here for details and how to apply. This is the last week of the regular 2015 state legislative session, and the House and Senate remain divided on critical components of the operating, capital, and transportation budgets. The main issue continues to be revenue. The question before lawmakers is whether they will get our state off the path of budget deficits and safety net cuts and onto a sustainable path with the revenue needed to fund our basic needs this year and in years to come. After many sessions of budget cuts, lawmakers have solid proposals before them to increase revenue while fixing our regressive tax system that currently allows wealthy households to pay significantly less of their income in taxes than lower income households. The 2015 Washington State Legislative Session officially ends Sunday, April 26. Legislators are likely to go into what's called a special session to finalize a budget. So you have just this week left to tell your legislators to pass a final budget that includes creating new sources of revenue and making deep investments in both affordable housing and safety net services. Join the Housing Alliance to debrief the session and to discuss how affordable housing and homelessness issues fared. If there is a special session, we will discuss what to expect and what advocates can do to ensure that the final budgets include the House’s affordable housing allocations. It is unlikely, although not impossible, that the House and Senate will be able to reach a compromise between the two profoundly different approaches to their budgets before this regular session ends. The House’s Budget includes new revenue, while the Senate’s relies on cuts, transfers and other budget “gimmicks”. If by April 26 (the last day allowed for regular session) no agreement is reached then Governor Jay Inslee will have to call lawmakers into a special session. It is not known what the governor’s plans are. He could call them back immediately or delay the special session convening to give lawmakers a break. Advocates can still influence the outcome of the final budget. You have all this week to insist that your lawmakers fund the Housing Trust Fund at $80 million and include all of the House’s operating budget allocations for safety net programs that prevent and end homelessness. You can help ensure our legislative champions stay strong and less supportive lawmakers have a reason to change their minds. Please take action today to send your lawmakers off with a strong and clear message about what the final budgets should include. My name is Paige McAdam, and I am thrilled to be the new communications intern for the Washington Low Income Housing Alliance. I was born and raised in Los Angeles and moved to Seattle in 2011 to attend Seattle University, where I am now a senior political science major planning to attend law school in the fall. In the long-term, my goal is to provide legal services to those who need it most. My specific areas of interest are in civil rights and bankruptcy law. I chose to move to Seattle because of the sense of community here, which can be rare in large cities. Four years later, I still see that sense of community every day and am so glad to be a part of it. My time at Seattle University has allowed me to become well versed on social justice issues and has given me a variety of opportunities to work within Seattle. During my freshman year, I was a contributing writer for Seattle-based street newspaper Real Change. I have also worked extensively in youth development, and I currently tutor math and science at Washington Middle School where roughly half of the students qualify for free or reduced lunch. I also worked as a mentor and academic tutor at a local nonprofit. The bright, dedicated, and endlessly talented kids that I worked with have inspired me beyond belief. And as cliché as it sounds, I’ve learned more from them then they have from me. As a result, I am extremely passionate about ensuring that all children have access to the resources they need to tap into all their potential. These experiences showed me the importance of creating dialogue and conversation regarding issues of poverty and homelessness. 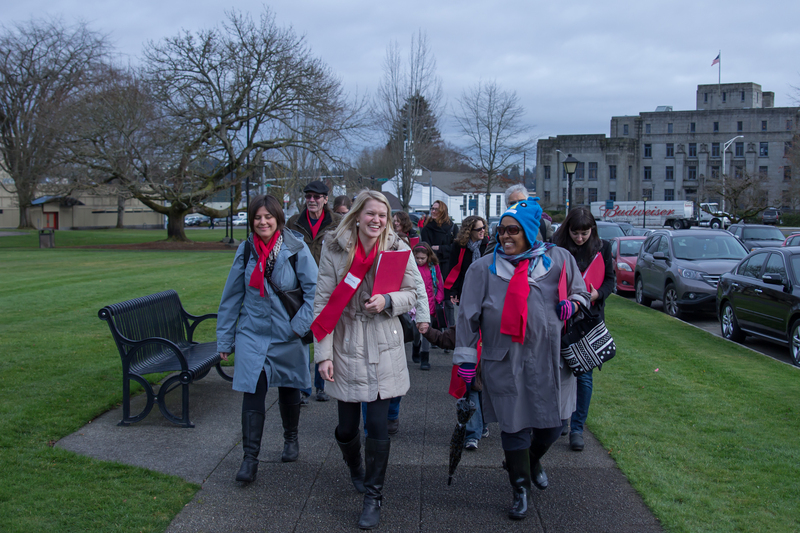 When I saw the opportunity to work with the Seattle University Project on Family Homelessness, I jumped at the chance to work with others striving to end homelessness. Lack of affordable homes is a huge problem in Washington State, and I believe whole-heartedly that it is a problem with a solution. 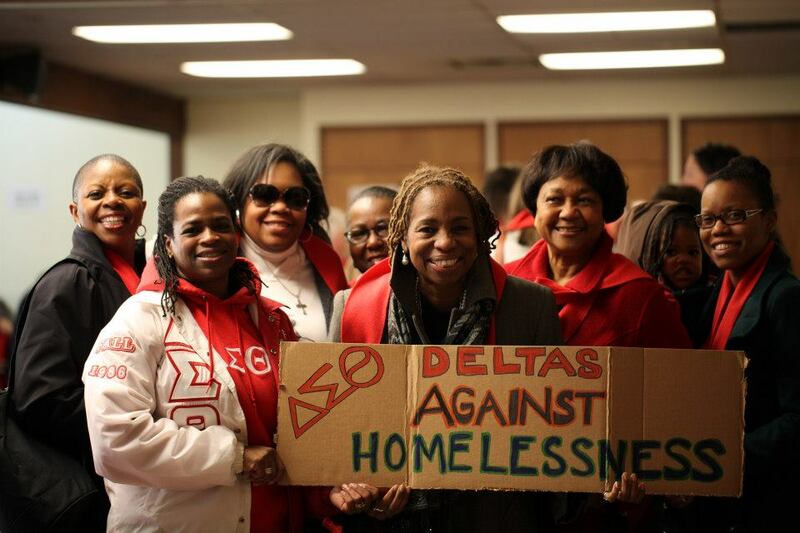 With over 18,800 people facing homelessness in our state, I believe that we can do better. I look forward to working with the Housing Alliance and learning more about the ways that systematic inequalities and issues lead to homelessness, as well as the ways that we can prevent this from happening. As a political science major, I have a strong interest in the ways that policy directly affects people, and am so excited to be working with like-minded advocates working towards change in Washington State. As a communications intern for the alliance, I’ll be working on social media, research, data analysis, graphics, and anything else that comes my way. I am looking forward to learning more about nonprofit communications, and am excited to work with the alliance as well as the Seattle U Project on Family Homelessness and its other partner organizations. The end of the regular session is rapidly approaching, and budget-related issues received a lot of attention last week. Lawmakers also spent a lot of time considering bills that have made it to the floor of the House or Senate. To get there, the bill had to make it through their own chamber of origin and then through the opposite chamber’s policy and fiscal committees. Bills not considered necessary to implement the budget (NTIB) will need a vote by Wednesday, April 15. Important bills continue to await for a vote including SHB 1223 (Springer), which will provide $45 million in bond revenue to King County for affordable workforce housing in transit-oriented neighborhoods. You can help push this bill forward by emailing your senator. Our friends over at Housing Development Consortium make it easy for you to take action. Simply click here to start. The Extended Foster Care bill, SSB 5740 (Fain) is still in House Rules and needs to be pulled to the floor where it can be voted on. Stay tuned to our social media feeds (Twitter and Facebook) for updates and action requests if these bills need another advocacy push to move to final passage. The Homeless Youth Act - SB 5404 (O’Ban) passed last Friday with a strong bipartisan vote. It’s now on its way to the Governor for his signature. Since it was what’s called “Governor Request” legislation, we are confident that the Governor will sign it soon. Thanks are due to Senator Steve O’Ban (28th - Lakewood) who was the prime sponsor. Please take a minute to send him a quick thank you for his leadership. Go the House Bill Report to learn about the final bill. The Senate Capital Budget is Released! The Senate both released and then had a public hearing on their capital budget last Wednesday. We were pleased to discover that their Housing Trust Fund allocation isn’t too far off of the House’s allocation, signaling an opportunity for the final budget to include the House’s $80 million. To read an analysis of both budgets, please see our blog post. It is very significant that both the House and Senate capital budgets have prioritized the Housing Trust Fund. This is no doubt due to your tireless advocacy for affordable housing that has been building in strength each year. Thank you to every advocate who has been educating and urging your lawmakers to adequately fund affordable housing. We aren’t done yet and need to keep pushing so the final budget includes the House’s capital budget allocation levels. The biggest difference between the House and Senate operating budgets is how they are funded. The House’s budget includes new revenue from both tax reforms and the closing of special tax preferences. The Senate’s budget includes cuts to state agencies, savings from not enacting state employee bargaining agreements, and other so-called “gimmicks” to avoid new revenue. The Senate operating budget also makes significant cuts to TANF (Temporary Assistance to Needy Families) and doesn’t include funding for important safety net programs such as state food assistance. Overall, we believe the state needs more revenue to get us off the path of budget deficits and social service cuts. The Housing Alliance is relieved both houses made no cuts to the Housing & Essential Needs/Aged, Blind & Disabled programs and SSI Facilitation services. But we know that these programs remain at risk each year unless our state reforms our tax policies. Washington has the most regressive tax system in the country, meaning that households with the lowest incomes contribute significantly more of their incomes in taxes than the wealthiest. Our lawmakers have a real opportunity for reform this year. HB 2224 (Carlyle), which we covered in last week’s blog post, is the revenue bill that would create a capital gains tax among other things. We urge all affordable housing and homelessness advocates to contact your lawmakers to ask them to pass this bill. Even if your lawmaker has previously told you that they will not support progressive tax reforms, they must hear from constituents who will support them if they change their minds. United For Fair Revenue is organizing a “Tax Week of Action.” Join in by calling your lawmakers today and urge them to “Pass HB 2224 because we need fair tax reforms and sustainable budget solutions.” You can learn more here. The last day of regular session is Sunday, April 26. The very significant differences between the House and Senate’s budgets will be difficult to reconcile by then. If they are unable to come to a final agreement, they will still end the session on that day, but will need the Governor to call them to back for what’s called a “special session.” The Governor could do that immediately, or could wait until the budget negotiators have a final deal. The coming weeks will provide more insights on what to expect. As always, stay tuned to Housing Alliance social media for updates. Read more about 2015 Budget 3.0 - Our Analysis. In support of the Stand for Your Mission campaign, BoardSource and the Alliance for Justice are hosting a series of free webinars on why advocacy is a critical tool for helping nonprofits accomplish their goals. The series will also explore best practices for the boards of nonprofits interested in doing everything they can to support their mission. I have been following Stand for Your Mission closely, especially since they released this excellent discussion guide for boards on the power of board advocacy. 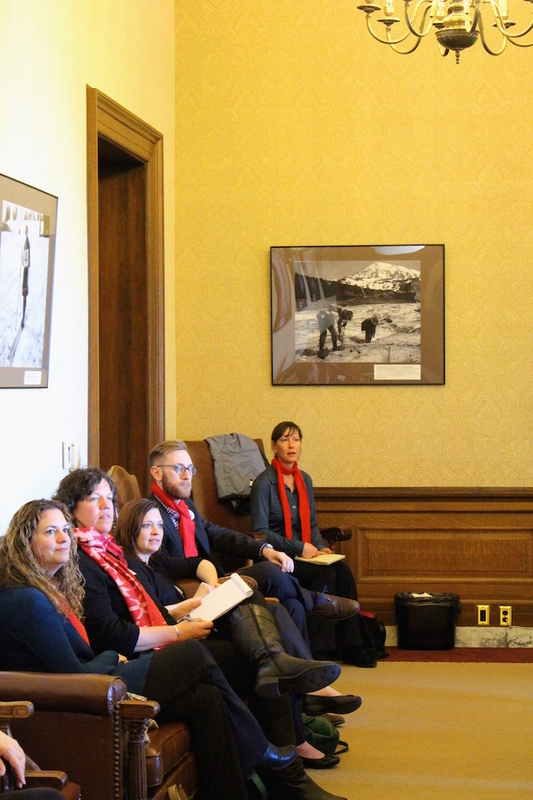 We’ve been talking about the power of board advocacy with members of the Housing Alliance for years now, and it’s exciting to see the rest of the country catching on to what we already know here in Washington State. I’m eager to hear what they have to say on these webinars… and did I mention they’re free? In webinar #1, BoardSource and the Alliance for Justice will be discussing what advocacy is (hint: it’s a lot more than lobbying) and how it can help public charities accomplish their goals. Check back here for an archive of this webinar. Contrary to popular myth, 501(c)(3) public charities can lobby. In this webinar, the second in BoardSource and the Alliance for Justice’s free advocacy series, they will provide an overview of what counts as lobbying, and how much you can legally do. In the last of our free series of webinars on nonprofit advocacy, Abby Levine* from the Alliance for Justice will share case studies explaining why and how several different organizations embrace advocacy. Last week was full of significant developments with three budget hearings, another policy cutoff, and a hearing on the House revenue proposal. The week kicked off with budget hearings and then ended with the House passing both their operating and capital budgets and with the Senate stymied by many hours of debate on their own operating budget. The Senate plans on more floor action this week and a floor vote on the operating budget. We’ve heard no official word yet of when the Senate will release their capital budget, but stay tuned to our blog and social media for updates. Take the Budget Advocacy Call-in Day Pledge! So far the legislature has released two operating budget proposals and one capital budget. You can read our current budget comparison here. We still have an opportunity to make sure the final budget invests in affordable homes and protects safety net services that help keep people off the street. Sign the pledge to call your elected official on Budget Advocacy Call-in Day on Tuesday, April 7. Then we'll email you on that day with a messaging template, phone number, and other details. Take the Budget Advocacy Call-in Day Pledge Here! As we reported last week, the House capital budget allocates a tremendous $110.2 million to affordable housing, and we hope that the Senate will follow suit. For a more detailed breakdown, see our blog here. The biggest surprise of the week was the Senate operating budget. It appears to fully preserve the Housing & Essential Needs (HEN)/Aged, Blind & Disabled (ABD) programs and SSI facilitation services! This was Senator Mark Miloscia’s (30th-Federal Way) number one operating budget priority this year, and he deserves a big thank you for his work to help produce the first Senate budget in many years that fully funds these critical safety net programs. Please click here to send him a quick thank you. Overall the Senate operating budget doesn’t include revenue and actually extends current tax loopholes and creates new ones. Their budget includes many fund transfers and agency cuts including massive staff cuts to the DSHS department that oversees safety net programs like Temporary Assistance to Needy Families (TANF), ABD, and SSI Facilitation. It assumes a lot of savings from unspecified “lean management practices,” and it transfers money from the capital budget. It also proposes a very significant cut to TANF and doesn’t restore cuts to basic food assistance. While we greatly appreciate that HEN, ABD, and SSI Facilitation were not cut, we also worry the budget contains hidden reductions that will result in cuts to safety net programs. For instance, we are concerned the Senate includes unrealistic budget assumptions around program savings that could result in future cuts. We’ve alerted lawmakers about this problem and will continue to address it so the final budget doesn’t contain any hidden or unintended cuts. 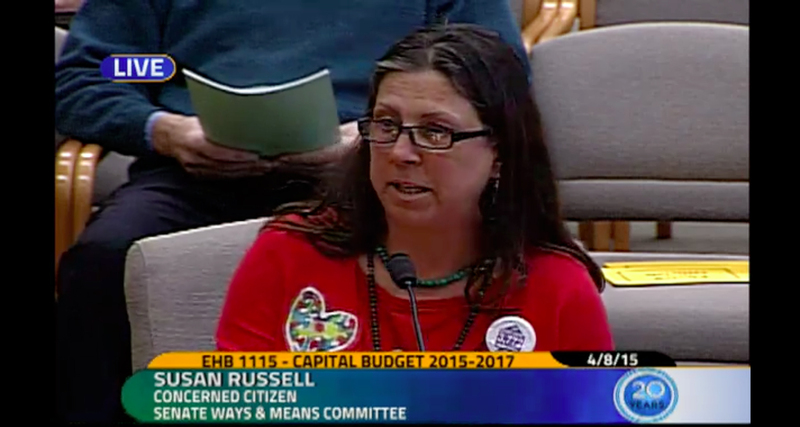 Their budget also does not include funding for a Medicaid Benefit for Permanent Supportive Housing. 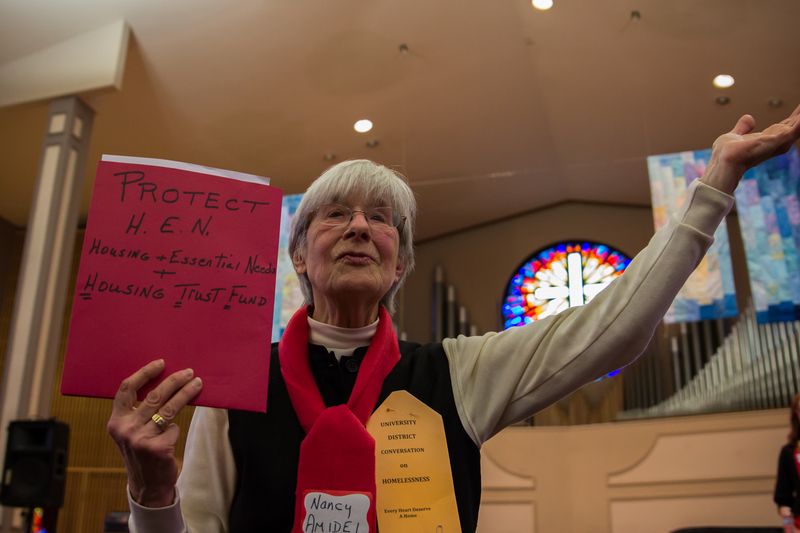 Senator Jeanne Kohl-Welles (36th-Seattle) offered an amendment in committee to add it, but it went down on a party-line vote. Please email her a thank you for trying to add this to the budget. 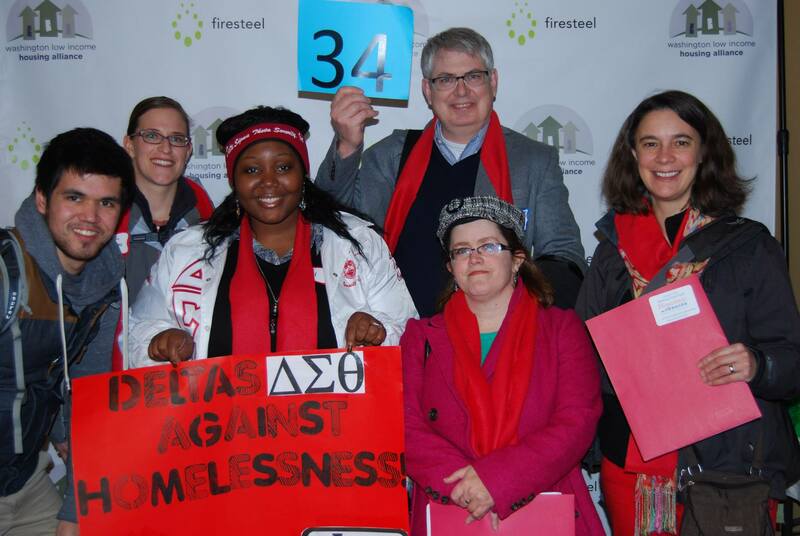 The House’s Operating Budget is good for affordable housing and homelessness and we urge the Senate to adopt it. The budget also funds DSHS staff to write a waiver to allow the state to use Medicaid dollars to pay for the tenancy support services delivered in permanent supportive housing. This is an exciting first development regarding our Medicaid Permanent Supportive Housing Services Benefit budget priority. With your consistent advocacy, we all can ensure it is in the final budget. Because of a legislative staff error, the original budget didn’t include this funding, and Representative Cody worked to amend the budget to include it. Please send her a quick thank you for her hard work. The House budget also fully funds HEN, ABD, and SSI Facilitation. It allocates $3 million to the Washington Youth and Families Fund and funds all of our support bills including the Homeless Student Stability Act and other important programs that protect low-income households throughout the state. The House’s budget is also more sustainable because it includes new and fair revenue. The House Finance Committee had a hearing on the revenue package last week with strong testimony from housing advocates Sonya Campion and Peter Shapiro. If the proposed capital gains tax passes, both said they would be subjected to it, and they welcomed it! (See below for more details on this tax.) The whole package is outlined in the bill report on HB 2224. Imposes a five percent tax on capital gains, which is a tax on wealthy individuals when they receive a windfall profit. Forty-two other states already have this tax, and it could bring in significant revenue each year. You can learn more about this at the Washington Budget and Policy Center’s blog. Reinstates the 0.3 percent business and occupation (B&O) surtax on service businesses. Increases a small business credit for service businesses. Eliminates a preferential B&O tax rate of 0.275 percent for travel agents and tour operators. Eliminates a preferential B&O tax rate of 0.138 percent for resellers of prescription drugs. Repeals the sales and use tax exemption for bottled water. Changes the nonresident sales and use tax exemption for tangible personal property into a remittance program. Narrows the use tax exemption for extracted fuel. Eliminates the preferential B&O tax rate of 0.484 percent for royalty income. Authorizes additional methods of establishing nexus for purposes of business and occupation and sales taxes. Limits the availability of a real estate foreclosure exemption. 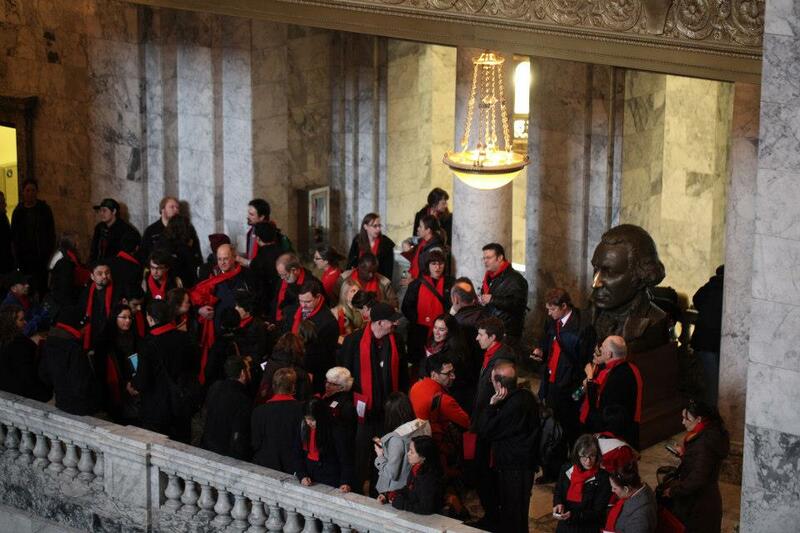 Unfortunately, last Wednesday’s cutoff closed the door for progress on most tenant protections this session. 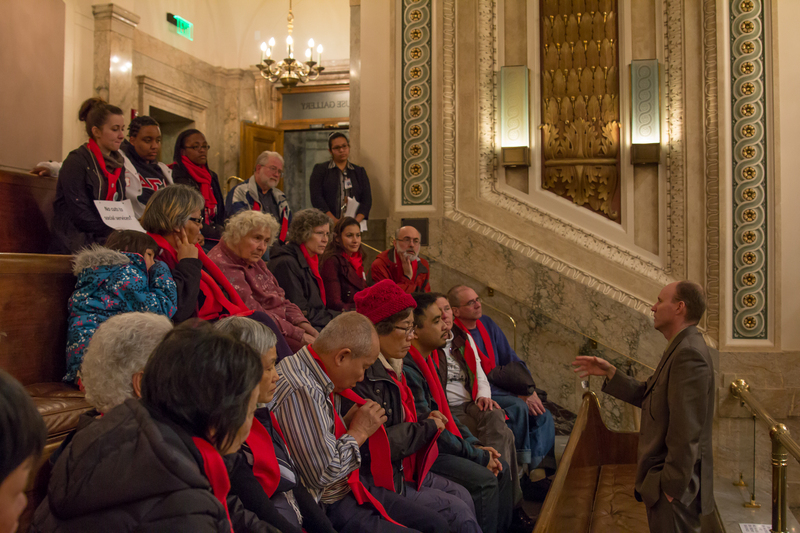 We thank everyone who took action this year to help advance tenant protection legislation. While we are disappointed that the bills are dead for this year, we know that the process educated a lot of lawmakers. This will help all of the bills next session. We witnessed incredible public testimony, deep education of lawmakers, and tremendous advocacy. Thank you! The interim will give us an opportunity to meet with lawmakers to hear more about their decisions to not advance the bills and to learn what could be done differently. We, of course, will also work throughout the interim to educate more lawmakers and deepen the support and urgency behind the bills. The good news is that also none of the many “bad” bills survived. Columbia Legal Services worked hard on one bill in particular and successfully transformed it from a problematic bill to a helpful one. SB 5538 (Angel) addresses a landlord’s obligations to store or dispose of the property of a deceased tenant. A father pushed it after his son was killed, and his landlord kept the deceased son’s property “for ransom” and charged the family $1,000 to get it. The bill passed the House Judiciary Committee last week and is now in House Rules Committee. Take the Pledge Now, Then Make the Call on April 7! We'll need a lot of advocacy and communication to legislators to bridge the gap between the House and Senate budgets. We are calling on all advocates to pledge to join the Housing Alliance in Budget Advocacy Call-in Day on Tuesday, April 7. Lawmakers need to hear from you at least once for each of the remaining three weeks of the regular session. Please click here to pledge to call your lawmaker on Tuesday and to organize two of your friends, coworkers, family members, or fellow board members to join you. We’ll send you the action page on Tuesday. It will have the state’s toll-free hotline where you can leave one message for all of your lawmakers, and we’ll also have suggested talking points. Our housing and homelessness analysis of the Governor's budget here: 2015 Budget 1.0 - Our Analysis. Our housing and homelessness analysis of the House's budget here: 2015 Budget 2.0 - Our Analysis. 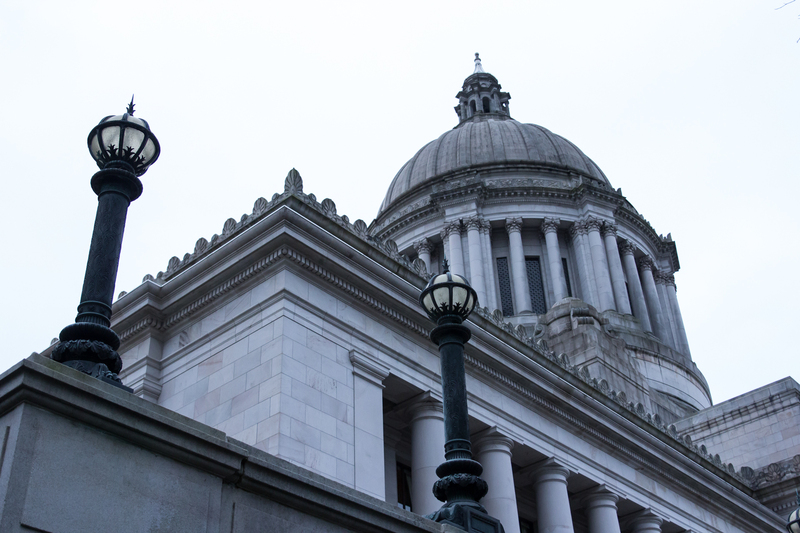 At around noon today, the Washington State Senate released their operating budget for the 2015-2017 biennium. You can read the budget in its entirety at this page. The Senate's operating budget is a mix of good news and deep cuts. The biggest surprise is that it does not include cuts to the Housing & Essential Needs program; the Aged, Blind & Disabled program; and SSI Facilitation Services. This is fantastic news and is a reflection of incredible advocacy over the past several years and recent weeks. This is the first year since the beginning of the Great Recession that all three operating budget proposals preserve these programs. Great work! However, we do see proposed cuts to the incapacity evaluations and also assumed savings in ABD that we are concerned about. We have a new updated Advocacy Action Alert that generates emails to both your senator and your representatives. The letter to your reps thanks them for protecting HEN/ABD/SSI Facilitation and the senate letter does the same and includes language about the coming capital budget. Go here to take action! See below for more details on the key programs we are tracking. Note that much of the below details are first-read analysis and are subject to updates. Check out our bill tracker here to compare each of the operating budgets. 1) Their budget proposal assumes $4 million will be saved due to increased federal SSI recoveries for ABD recipients who move to SSI. We are concerned that this savings estimate is too high and could result in cuts to DSHS and/or ABD. 2) The budget proposal also assumes that there will be a savings in HEN/ABD incapacity evaluations due to: applicants having better medical records as a result of Medicaid expansion, and the 12-month HEN referral authorizations. The incapacity savings is grouped together with savings from an unrelated program, so the fiscal assumptions behind this savings are unclear. We are concerned that the budget overstimates savings and could result in a cut to incapacity evaluation services. This fund provides stable, long-term funding for both on- and off-site supportive services linked to affordable housing for young people and families. While we recommended investing $6 million for the fund, the Senate allocated only $2 million in funding, lower than each of the House's and the Governor’s allocation of $3 million. The Senate's budget proposes deep cuts to TANF. Together, the proposed TANF cuts amount to about $50 million and the 15% cut to the cash grant is not reversed. We didn't expect this to be in the initial Senate budget. But, we will be pushing to make sure this is included in the final budget. This would allow more chronically homeless people to access housing and services and help individuals with severe and chronic health issues stay off the street and live in a healthy home. Stay tuned, as we’re sure to have more developments next week. More about this benefit at our state advocacy page. Unfortunately, the Senate budget doesn't add any new revenue. Savings come from many different sources, specifically cuts to programs, to state worker compensation, to Commerce, and to DSHS's ESA program area. This is the program area that oversees TANF, ABD, SSI Facilitation, food assistance, etc. The Senate budget also fails to restore the State Food Assistance cuts and doesn't fund Breakfast after the Bell (SHB 1295). Washington State 211 information service and WTAP (Washington Telephone Assistance Program) funding are also eliminated. WTAP allows Washington residents with low incomes who are on food assistance, cash assistance, or Medicaid to get a break on the cost of their telephone landline. WTAP serves 43,000 people, and 19,550 people on WTAP are 65 and older. Some critics suggest eliminating WTAP because they believe people will just use cell phones. However, many people in our vast state live where cell phone coverage is spotty or doesn’t work, as much of Washington is rural. For example, there are 25 rural school districts in Washington with enrollments of less than 1,000 students. A look at the major carrier coverage maps show areas of no cell coverage. And, many older people don’t have cell phones. Their landline is their only phone. Additionally, WTAP funds are used to provide community voice mail to homeless individuals. This provides people without a fixed address (and certainly without money for cell phones) a way to pick up messages from potential employers, landlords or social service providers. No word yet on exactly when the Senate will be releasing their capital budget. But you can bet that we'll have our analysis up shortly after. In the meantime, please take action on the budgets that have already been released!